External lightning conductors provide protective shield. New patented SiedarcTM grounding electrodes above waterline. 1 ft2 grounding strip below lazarette at stern. Zone of protection covers all decks. Transient suppressors on VHF antennas. Wilma and Wink Thornton had experienced the effects of a close lightning strike a couple of times too many. When contemplating a life as liveaboards on their new Mirage Great Harbor 47 John Henry,their vision did not include cowering in a state of deep anxiety at the first rumble of thunder. And Wink's profession in the Insurance and Risk Management Industry stood him in excellent stead to assess risks and mitigation. Consequently, their requirement for lightning protection was simple –"The best possible". So when Ken Fickett, CEO of Mirage Manufacturing, mentioned a new type of lightning protection system that showed promise of being vastly superior to traditional techniques, Wink's response was fast and in the affirmative. However, it does not take a close and personal relationship with lightning to appreciate the hazards involved in living aboard. Since escaping from the storm is completely impractical, the only option is to hunker down and reflect on the safest strategy to avoid potential injuries. After a moment's reflection it will become apparent that the time to implement the safest strategy was actually while the boat was being built or during the last refit. An inbuilt lightning protection system is the only way to assure piece of mind. But the idea of running a lightning cable right through the middle of the living area to a ground plate is not particularly appealing, especially when you realize that the most hazardous place in the boat is now between that cable and the water. This is right about where you just placed your recliner. There has to be a better way to do it than the traditional method. 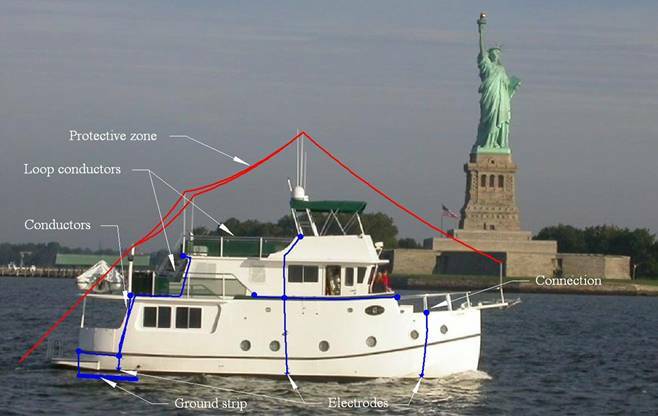 First let's address whether the middle of the boat really is the best place for a lightning conductor and ground plate. The answer lies in protection systems that have been developed and refined successfully over a couple of centuries – those on buildings. Look at the lightning protection system on any building and you will see a myriad of lightning rods at the edge of the roof line, and multiple conductors running down the outside of the building, with each conductor morphing into a copper-clad grounding rod before disappearing into the soil. The key concept here is that the lightning conductors are on the outside. On the other hand, in the case of lightning conductor running through the center of a boat, voltage differences ("step voltages") between this and the water are conducive to dangerous sideflashes, that may involve conducting fittings or crew members on the way. So the short answer to our question above is a resounding "No". Instead, what we need to do is route the conductors close to the outside of the boat to minimize the risk of sideflashes between the lightning conductors and other onboard conductors. The backbone for the external network of lightning conductors is a continuous loop. 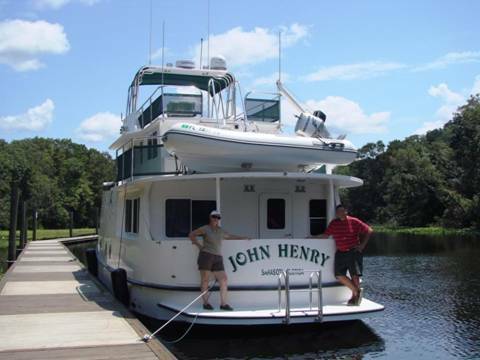 In the case of John Henry, we actually have two loops, one at flybridge level and another at main deck level. Connected into the conducting loops are the air terminals and grounding conductors. The zone of protection provided by the air terminals covers the whole deck area. One fundamental problem with transferring the building design onto a boat is the part about the "copper-clad grounding rod …. disappearing into the soil." On a boat, or at least one that plans to move through the water without long copper appendages flailing about, this is not an option. So the next point is grounding. Grounding is the process whereby lightning charges move off the boat and into the water. In order to do this, contact with the water is not needed. Indeed, lightning exits perfectly well from boats that have no grounding at all, albeit capriciously. In this case the final few feet is bridged by the lightning making its own path. On the way, intervening conductors provide attractive conduits, and the surface of the water is a favorite destination. Damage to boats where this has happened lays to rest another piece of folklore – that lightning always takes the straightest path to ground. So what would happen if we provided a network of oversize cables that ended just above the water? This would take care of the problem with sideflashes inside the boat, but would increase the chance of sideflashes from the lowest points of the conductors. This is actually a good thing since it lowers the likelihood of sideflashes from nearby conducting fittings. In fact, what we would like to do is promote a spark from a device that is designed to handle it safely. Fortunately, we already have specifications for this type of device – those for lightning air terminals (or lightning rods). The six SiedarcTM electrodes on John Henry are made from ½" copper, the same specification as for an air terminal. By distributing them around the hull just above the waterline, we not only complete the desired external network of lightning conductors, but also induce the lightning current to flow away from the hull from multiple exit points. While the SiedarcTM electrodes eliminate the need to bore holes through the hull below the waterline, an obvious advantage, we also wanted to adhere to accepted convention in providing an immersed grounding conductor as well. An immersed one square foot grounding plate or strip is usually recommended in the typical protection guidelines as it provides for a direct conducting path to the water. On the other hand, there are incidents of ground plates blowing out of the hull. The most likely explanation for this is that water in pockets in the hull evaporates into high-pressure steam when some of the lightning current flows into these pockets. So, in addition to carefully sealing all through hull penetrations, in John Henry we took the additional precaution of placing the ground strip in a watertight lazarette at the aft of the boat. In the remote chance that these hull penetrations start leaking after a lightning strike, the amount of water taken on board will be shallow and contained.